I've moved a lot as a child but it was nothing but exciting and fun because we had a professional moving service come in and do all the work for us. The only thing I had to do was take things out of my closet and organize them in piles to be packed. As I grew up and began moving from city to city, the moving was all up to me and did I have $200 to spare on a moving service? You bet I didn't. My family would be surprised that I'm writing about tips on how to move because despite four moves in four years, I'm the one who still needs reminders and tips. So, let my loss be your gain. Print this quick list out because you can trust I've made enough mistakes to become an expert mover. 1. Your friends and family will most likely be your free moving help. Pick two who don't whine and are going to put up with your commanding attitude. A team of three is ideal whether you have a little bit or all of your life's possessions to move. 2. A toolbox is a must-have during a move. Don't just bring a wrench or a screwdriver. Bring the entire toolbox because you don't remember what size bolts and screws are in that desk or bed frame. 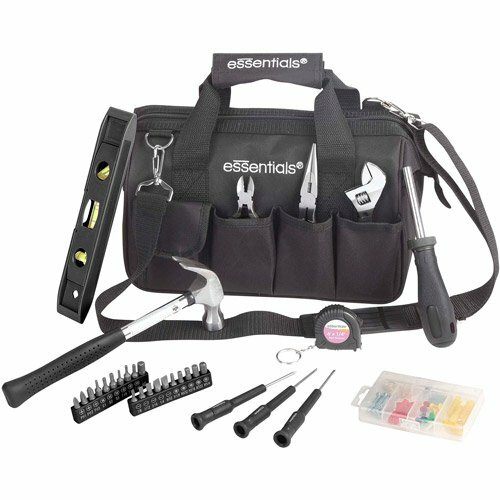 I use the Essentials tool kit. It's compact and really does have all the essentials as the name suggests. 3. Boxes with packing tape are durable and easy to label. Go to Lowe's and pick up some strong cardboard boxes as well as packing tape. You can pack your clothes or heavy kitchen appliances in a good cardboard box which you can then save and re-use next time. I suggest getting 2-3 extra boxes in addition to what you think you'll need. Usually you underestimate how much stuff you've accumulated and those extras will become necessary. Also, do not over-stuff the boxes. Leave some space and pack smart. Pack by category, meaning how you'd like to unpack them and use the box space well but not to a point where you can barely lift it. 4. Water will be your best friend during a move. Whether you're on the 1st floor or scrambling up and down the stairs, you will be burning lots of energy walking back and forth. Bring a cold pack of water bottles for yourself and your moving buddies. I don't recommend bringing a cooler since it'll then take up space in your vehicle. Again, I can't emphasize enough that you will underestimate how much stuff you have so plan to use every space in the vehicles you'll be using. 5. A box of heavy-duty trash bags will be useful. As you rummage through your things, there will be pieces you'll want to finally get rid of. Moving is an eye-opening experience. You will discover objects you haven't missed for a split second but have dragged around with you for ages. Maybe it'll be time to let some things go. Use the trash bags to throw away real trash, things you're ready to let go, to pack donations, and to pack all the miscellaneous things you find after you thought you finished packing it all. With these tips, I hope your next move is a smoother transition toward your next chapter. Moving is a great experience. You're taking a step (hopefully forward) to adding a new experience to your life, and that's exciting! Don't let the moving process put a damper on your party. Some good tips. We'll be moving a family member next month and I love the idea of trash bags. Thanks! Thanks for reading and your comment, Leigh!. One thing I wanted to add here is if you're moving from a rental property, I highly recommend taking photos of how the places looks after the move out. Happy moving!